Labour's Jim Knight has lost his Dorset South seat to Conservative candidate Richard Drax. Mr Drax polled a 7,443 majority over Mr Knight, who was work and pensions minister in the last government. 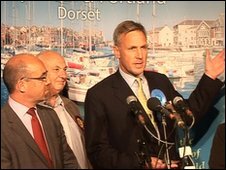 Other election results in Dorset have seen the Tories strengthen their strongholds across the county. However Liberal Democrat Annette Brooke clung on to her Mid-Dorset and North Poole seat by 269 votes over the Tories, losing 4.9% of the share. The Conservatives strengthened their leads in their existing seats of Poole, Christchurch, Dorset West, Dorset North, Bournemouth East and Bournemouth West. They now hold seven of the county's eight constituencies. Christopher Chope won in Christchurch, one of the strongest Tory constituencies in the West Country, with 27,888 votes - a 15,410 majority over the Liberal Democrats. 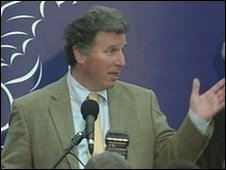 In Dorset West, Oliver Letwin won with a 3,923 majority over the Lib Dems. Lib Dem Annette Brooke narrowly retained her Mid-Dorset and North Poole seat by polling 21,100 votes, while Conservative Nick King came a very close second with 20,831. In Bournemouth East, Tobias Ellwood took a 7,728 majority, while in Bournemouth West Conor Burns won with a 5,583, both over the Lib Dems. Mr Burns replaces Sir John Butterfill, who stood down as MP in Bournemouth West before the expenses scandal broke - during which he agreed to repay £20,000 in tax and mortgage payments. In Poole, Robert Syms won with a 7,541 majority over the Lib Dems. Bob Walter held his Dorset North seat by a 7,625 majority over the Lib Dems. Labour lost 11.4% of the share of the votes in Dorset South, 10% in Poole, 8.1% in Bournemouth West, 5.8% in Christchurch, 5.3% in Bournemouth East, 4.2% in both Poole and Dorset North and 1.1% in Dorset West.